So you want to make your own flies because, obviously, it’s so much cheaper than buying artificial lures each time you need one. And you don’t need just one—you need all sorts of patterns depending on what you’re trying to catch and where you’re fishing. Besides, anglers seem to derive as much joy in fly tying as in actually fishing, so why not give it a try? Since you’re seriously giving this a thought (the fact that you’re on this page gives that away), we suggest that you check out the Griffin Odyssey Spider Cam vise. What do we like about Griffin fly tying vise? It’s not expensive. For someone who is testing the waters, it’s a good idea to not splurge so much. Okay, this vise is not cheap either. It would be fair tosay that it hit that sweet spot just above cheap but slightly below the mid-range price of fly tying vises. It is durable. It is made of heavy-duty materials which have been tested to resist breaking or bending under normal use. It’s a true rotary fly tying vise. You need a vise to hold the hook for you as you embellish it with various materials. Why do you need a true rotary vise to do that? To put it simply, when you rotate this type of vise, the hook shank lines up perfectly on the same horizontal axis of the rotary shaft. There’s no wobbling above or below that line.This makes tying and gluing so much easier and allows you to view the fly from all angles. It was designed with the beginner angler in mind. As Griffin’s entry-level true rotary vise, it is easy to use and simple to adjust. It rotates 360 degrees and holds the hook securely for you, so you can pour all your energy and attention to the work at hand. It has a powerful jaw for holding a hook from size 28 to 4/0. That’s almost all the sizes you will ever need. It comes with an adjustable bobbin cradle – this arm is easy to position and locks on the stem with a squeeze. It has no knob or thumb screw to deal with. The height is adjustable–you can make infinite height adjustments with the screw lock. It has the manufacturer’s 100% lifetime guarantee – it includes replacement of the item without cost if workmanship is defective. It’s made in the USA– you can easily ask for assistance or inquire about issues you may later have. It will also be a breeze to add accessories that are available for this item. It can’t handle hooks bigger than 4/0 – saltwater anglers will not be so thrilled about this limitation. But just so you get the picture, you can use size 4/0 hooks for catching fish of up to 10 pounds. The jaws are fixed and smooth on the inside – unlike in the Peak rotary vise, the jaws in Griffin Odyssey Spider cam vise are not textured and not replaceable with midge or saltwater jaws. It does not come with a pedestal base – if you prefer a pedestal base, then this will definitely not work for you. You can buy the pedestal as an add-on, though, or use other pedestals designed for standard 3/8” vise stems. The pedestal weighs 4 pounds, so take note of that especially if you travel with your vise equipment a lot. The small pieces are made of plastic – we’re mentioning this so you know what you’re getting. Seriously, we don’t think it has a significant impact on how this vise performs. Fly tying requires patience, skill, and the right tool. We know that choosing the best vise doesn’t come easy, especially when you’re still warming up to do your own fly tying. 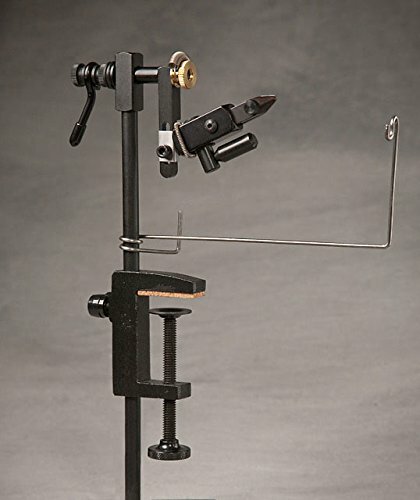 Griffin Odyssey Spider Cam Vise is a basic cam-operated true rotary fly tying vise. As such, it has a shorter learning curve which is important for beginners. It’s true that its entry level price is hard to beat, but make no mistake about it. The price tag of Griffin fly tying vise is not the sole thing that makes it a great buy. On the contrary, it performs as any true-rotary fly tying vise should. It is solidly made and tolerates the rigors of traveling and the sport. Plus, it is portable and perfect for bringing along on fly fishing adventures, which makes it your perfect travel and fishing buddy.